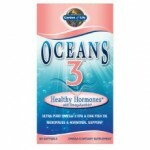 Oceans 3 is a dietary supplement for supporting hormonal health in women. It can also be used to relieve the different symptoms associated with menopause. It uses a special high potency form of omega-3 plus a range of herbal extracts that have been used for a long time in traditional medicine. One container with 90 soft gels is being sold online for $41.59. How Does Oceans 3 Work? Helps relieve the different symptoms of menopause. Helps manage stress and improve emotional health. Helps the user achieve quality sleep. Boosts energy levels and helps reduce fatigue. Supports the biosynthesis of collagen for healthier skin. Promotes cellular health through antioxidants. Oceans 3 Ingredients – Are they Safe & Effective? OmegaXanthin – This active ingredient is only available in Oceans 3 formulations. It is a synergistic blend of the highest purity and potency fish oil rich in DHA and EPA along with astaxanthin and fucoxanthin which are powerful antioxidants from the ocean. Lifenol – This is a patented form of wild hops extract which is clinically proven to reduce severity and frequency of hot flashes. Ashwagandha Extract – This is a special herb used to manage stress, promote a positive mind and mood and calm the mind of the user. It helps inhibit overeating due to stress and studies have shown that it can also curb cravings for high carbohydrate food. This helps prevent weight gain which is a common problem during menopause. Amla Berry – This natural ingredient supports the biosynthesis of collagen which is a very important part of maintaining youthful and healthy looking skin. Vitamins A, D, E, K, B1 and B12 – These are essential vitamins that support women during their stressful menopause transition. The formula essentially works by providing the user with essential nutrients and powerful antioxidants that help relieve the different discomforts women experience before, during and after menopause. It also contains several herbal extracts that help address menopause symptoms and improve the mood of the user. The formula also contains essential vitamins that promote overall health and well-being. What are the Advantages of Oceans 3? Oceans 3 contains powerful antioxidants that ma help improve* cellular health. The formulation is all-natural and doesn’t contain synthetic hormones or harmful chemicals. It contains a potent form of omega-3 fatty acids which may offer a range of health benefits. What are the Disadvantages of Oceans 3? It is expensive compared to other hormone supplements. It is from Garden of Life which is not a renowned supplement company. For adults, take 3 soft gels daily. It is best taken with meals followed by a glass of water. Refrigerate after opening in order to preserve freshness. Menopausal women can take 9 soft gels daily taken 3 at a time with meals. What precautionary measures shall be undertaken while using this supplement? This product is not intended for children. If you are pregnant, nursing, taking pills or other supplements, or have any health problems, consult your healthcare provider before use. Oceans 3 is just an average hormone supplement. There are some positive reviews from people who have tried it but the problem is that there is no clinical evidence that it really works. Also, there are some negative reviews saying it doesn’t work effectively in relieving menopause symptoms. It is still a product worth trying but there are better menopause relief formulations on the market.